I'm always on the look-out for new ideas and inspiration for my tablescapes. From designers to bloggers, there is always something new to learn. Here are a few from my file, plus a few of my own that are my favorites. 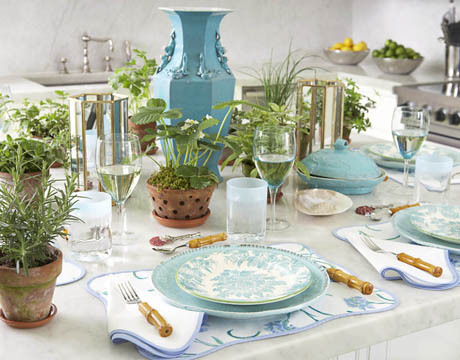 I love the turquoise table above by Tory Burch, with the juxtaposition of rustic vs. elegant. The bamboo flatware adds punch to the mixture of blue hues. Joe Nye also used bamboo flatware in his jewel tone tablescape. I like the yellow cabbage leaf majolica with the blue transferware. Very elegant! Tory Burch and Joe Nye's use of faux bamboo influenced me to use it in a tablescape I did last summer featuring Provençal linens. They were a bargain from Ross! Of course, nobody does it better than Ralph Lauren! Huge inspiration for me! Pattern on pattern. Layer upon layer, he is the king of mixing it up. Pattern on pattern. Layer upon layer, mixing it up is what I like to do as well! Silver and crystal with white plates and textured linens. Yes! 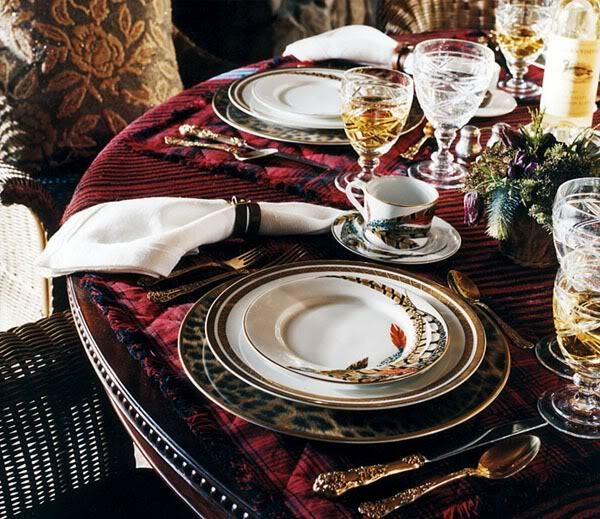 Here is a similar tablescape using the same flatware, chargers and plates featured at the Ralph Lauren flagship store in NYC. Lisa Ruby Ryan does the same thing with this table. 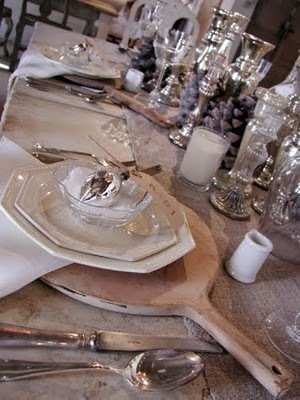 Textured linens, white dishes, crystal and silver. What a fabulous idea to use a breadboard as a charger plate! Love it! I love the combination of textural linen with the smoothness of silver, ivory and crystal in this setting designed by Terri Long and Lisa Dell 'Osso. Here is one of my favorite tablescapes that I did last year. An attempt at keeping it simple! It's all about texture. 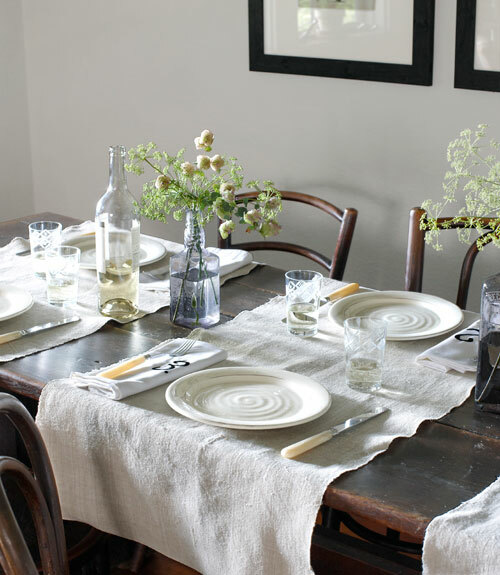 This simple table setting is made more interesting with the runners laying across the table. A couple of simple bouquets is all that is needed. 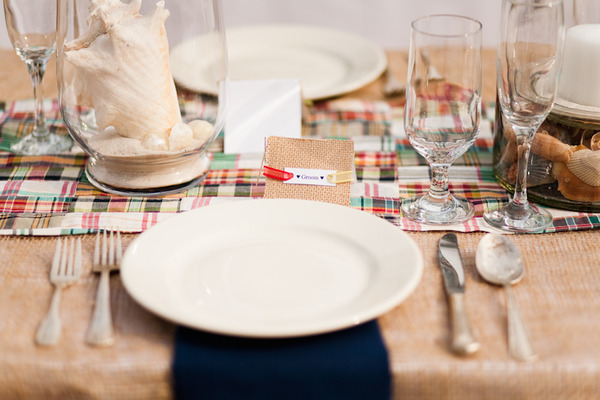 How cool is this table with the madras plaid runner on burlap? Perfect for a beach theme. Bunny Williams set this table for a luncheon in her conservatory. 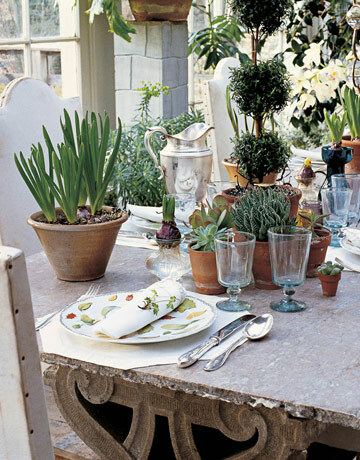 I love all the succulents and ivy, and of course, the rustic stone table. 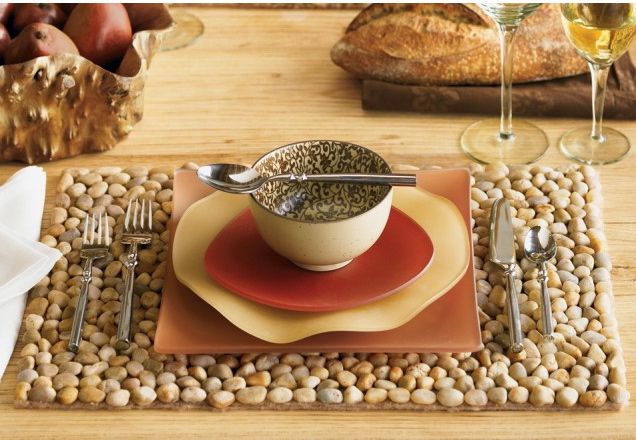 When I saw the pebble placemat, I thought of so many possibilities for tablescaping! This tablescape was a huge influence on me. It was the inspiration for a table I set for my book club dinner last December. I used classic books for the centerpiece. The place cards were book marks that I made from upholstery webbing, which my guests took home. The napkin "rings" were pages from a book, tied with twine. Tablescaping runs in the family! All three Arabian sisters-in-law love dishes and love to set a fancy table. Ann set this table for a birthday luncheon for her Mother using her wedding china. Her centerpieces are always incredibly creative, and inspiring to me as well. I recently set a table using these dishes from the flea market. I bought them as a gift for sister-in-law Mary to add to her collection of this Johnson Bros. pattern. But first, I needed to do a tablescape! Today, I'll give them to her when we meet for lunch to celebrate her birthday. I have no doubt she will set a fantastic table of her own, probably for Thanksgiving! Another place that I find lots of inspiration for creative tables. They are ALL so gorgeous.....my favs are that turquoise transferware!! and the Johnson Bros...I have some of that myself that was my granny's....love it! Your ideas are great! Great review of some very inspirational tables. They're all so beautiful! I love the one with all the layers, the Provence one and Christmas! You are so hired! I love yours as much if not more than 'the pros" one is as gorgeous as the other and I don't use the word lightly, being a fellow tablescape fanatic!! Just stunning, love the layered look..so many beautiful settings here for so many seasons. Bookmarking this post for sure! Great previews full of inspiration. It is clear there is so much one can do for tablescapes..with little or a lot. Great post and pics! 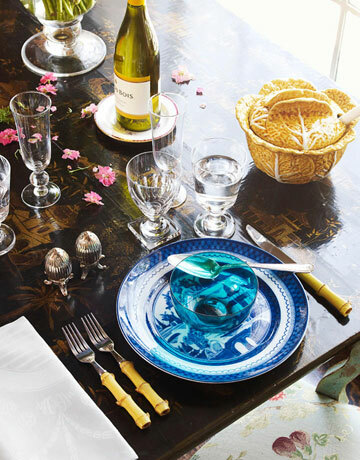 What beautiful tablescapes that provide such inspiration. 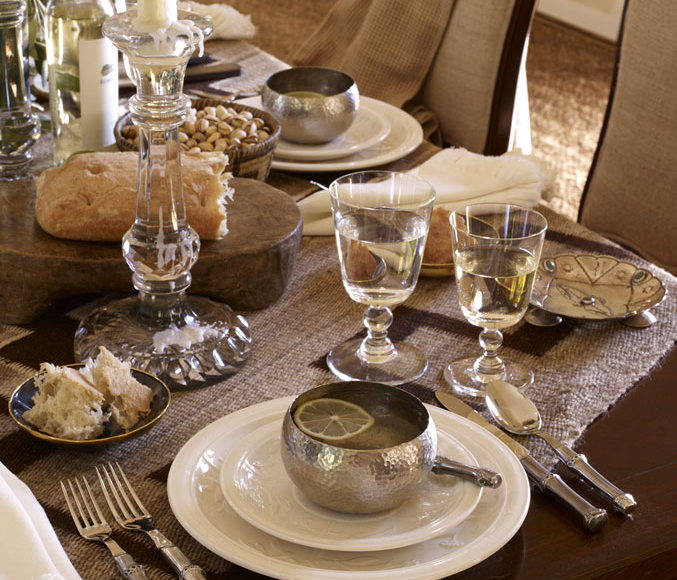 The Ralph Lauren and Lisa Ruby Ryan tables are our favorites. Love the bread boards as chargers! Gorgeous tables! Ralph Lauren's are great but your tartan table with books is my favorite! I feel faint....truly some WONDERFUL inspirations here, Delores but I like all of yours the best. I will have to take some time to go hunt down the posts that go with them. I feel bad that I can't seem to keep up with all the beautiful blogs that I love. Real life & those grandbabies just keep getting in my way! Thank you for sharing each & every one of these gorgeous tables, mostly for sharing your own. Back to say I just signed up to get ALL your postings via email. I didn't know you had that!!! Now I won't miss any! So many beautifully set tables -- love all the inspirations. The colors are wonderful - so much texture too--- these are all lovely to behold. please don't make me chose!! Delores, your tables are always an inspiration to me. I have a visual imprint of several of your tables that I play over again and again in my mind's eye. Among my favorites are your fly fishing tablescape and your book club table to name just two. I especially loved Ann's table with the Gerbera Daisies highlighting her beautiful china! Many fun and festive meals have been eaten off those vintage plates! Your book club guests must have been SO impressed. I am!!! This post makes me want to have a party. You embody all of these BEAUTIFULLY! I really enjoyed this "retrospective" correlating with your inspiration shots. That Ralph Lauren photo & your rendition are some of my favorites OF ALL TIME!!! I always admire your post about table settings! I love also the way you photographs!Outstanding photography indeed! All I can say is you have an incredible gift when it comes to tablescaping. Thank you so much for sharing, it's such an inspiration. 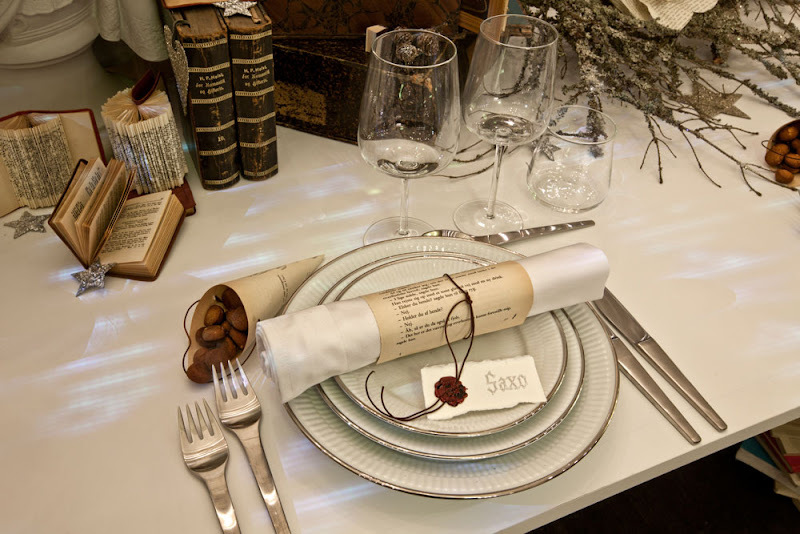 Your tablescapes are so creative and inspiring as are the other examples you chose. Thank you for sharing them. These are truly inspirational!! Love them. Where did you get the bamboo flatware?? Ross??? Also, love your attitude on the Carrar marble......so? Your tablescapes are absolutely stunning, head and shoulders above the rest...I am so inspired by all that you do and share.... I got the nerve to use starks antelope carpet on our first floor because of your use of leopard print carpeting which you blogged about. I am thrilled the results. PS What Johnson bros. Pattern is that...the one you are generously giving your SIL...? It is very sweet...it's hard for me to find anything Johnson brothers that I dont like! Beautiful and inspirational! Your tables are always a feast for the eyes. Really beautiful tables! I, too, am a rabid fan of Joe Nye, Bunny Williams and, of course, Ralph Lauren. They all have very different styles, but each can be appreciated for what they are. So nice of you to gift your sister-in-law with those beautiful Johnson Brothers dishes. I am certain they will be enjoyed for many years to come! These are all so beautiful, but my favorite is the one that is the most simple. The simple flower arrangements, the creamy white plates, bone handled knives, simple glassware without a stem, the table runners going across the table to serve as a place mat and the numbered napkins...love those! They are all beautiful and inspiring. Yours are very very special to us. Do you have any idea what this many pics of gorgeous settings does to someone like me? I need 8 of each...no 10...is that enough? Every pic...stunning. YOU are the inspiration, Delores! I was so excited to see the yellow cabbage leaf majolica lidded bowls in the one setting. I purchased 4 of them on Ebay just yesterday. Now I am even more anxious for them to arrive. As always, thank you. Yours were my favorites... you have the magic. Hi passed an award onto you today! Its on my current Sunday post..stop by.